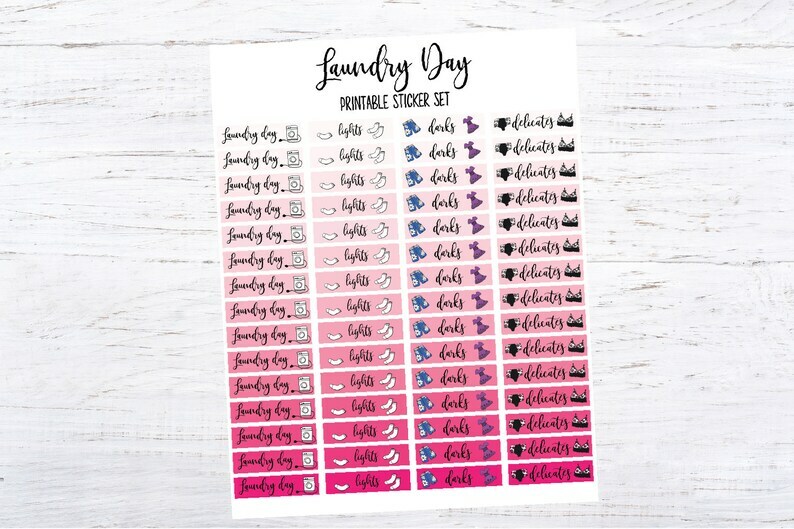 This 1 page printable sticker set includes "Laundry day" "lights" "darks" and "delicates" stickers. (This is an Instant Download DIGITAL LISTING, no physical item will be sent to you in the mail. ) This set includes non-editable PDF and PNG formats, plus a SVG cut file for your compatible cutting machine. Print out at home on adhesive backed paper, or use cardstock and your favorite adhesive to stick on your scrapbook, journal, bullet journal, planner, organizer, agenda, calendar, etc! Very easy, ready to go, format. Just Print and cut out by hand, or with your scan and cut or PNG or SVG friendly electronic cutting machine. If you'd like to order this set in a different color that you don't see in my shop, feel free to send me a message! I usually don't charge extra for small modifications like this. This set was designed to be printed on US Letter sized paper, but any similar dimensions should work fine! You can even shrink it down smaller if you'd like smaller stickers for littler pages. Stickers printed on US Letter Sized Paper PRINT APPROX. 2" wide by 0.5" tall. *PLEASE NOTE that this set comes BY THE PAGE, and does NOT include individual png clipart graphics. * Be sure to select "FIT TO PAGE" when printing sizes other than US Letter (8.5" x 11"). I do not offer refunds on digital downloads. Purchased designs can be printed unlimited times (for yourself). Digital files may not be shared with anyone. If you're not sure how to use these kinds of digital files, please refer to the tutorials on my blog before purchasing. After you complete your purchase, you will receive email notification that your digital download is available. Please download all files within 30 days. Doodle Bullet Journal Printables (bujo) UNICORN Edition! - Printable Planner Inserts ready to fill in and COLOR IN! ready to go pdf! These were super easy to download. open and print. Excellent transaction. Thanks! Bullet Journal Printables (bujo) JANUARY - Snow Fight - Printable Planner Inserts ready to print, fill in and COLOR IN!